As you may recollect Transition Bath received a grant from BWCE at the start of the year to run a feasibility study for an electric bike commute to work project. The new project aims to encourage commuters in Bath to switch to cycling to work in preference to commuting short distances by car. The focus of this initiative is electric bikes (ebikes) in order to reduce the barriers to people who are put off cycling by Bath’s hilly terrain, or consider themselves too unfit to commute by bicycle. Over the course of the last 8 months, we have been making excellent progress and we think we have put together a good case for running the project from March 2019, once the warm spring weather returns. Now all we need to do is find some funding for the project – probably about £10K! 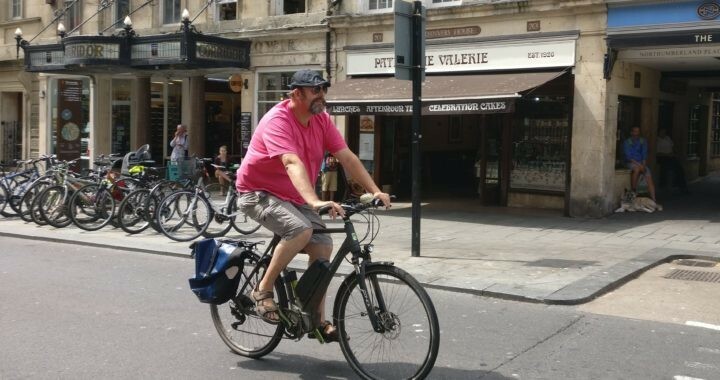 written a number of interesting case studies of electric bike users, including Mark Shelford, Councillor for Transport, Caroline Kaye, CEO BPT, Adam Reynolds, Chair Cycle Bath; we are also hoping Wera Hobhouse, MP will be able to provide us with her experience of using an electric bike in Bath? We now feel we are almost ready to start applying for grants to run the project from March. However, if you know of an SME who would be interested in getting involved next summer, please let us know, as we may be able to take on more participants?